Books by Banks never disappoint. His writing is as harsh and beautiful as a New England winter. 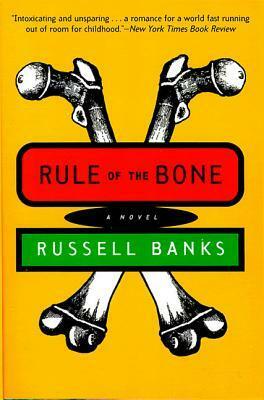 Rule of the Bone speaks with a social conscience that cannot be ignored or denied. The voice he uses carries credibility and authority characteristic of the seasoned master of fiction the writer has become. This story is told in the first person. The protagonist is what those of us who work with poor kids refer to as a “throw-away”, those who don’t run away from home but are simply not welcome there anymore at an early age. Often, as is the case with the fourteen year old boy who renames himself Bone, it is a step-parent who in one way or another initiates the departure of a child who is far too young to make his own way in the world, and the birth parent who is passive and therefore complicit. Without job skills, social or interviewing skills, or any knowledge of how the social welfare system works apart from the fact that it doesn’t, he becomes a feral child, finding indoor shelter wherever he can: hiding in a custodial closet when the mall shuts down for the night; crashing with a biker gang that is dangerous and unpredictable but who tolerate his presence most days because he can find weed for them; and in an abandoned school bus. Twice he tries to initiate a reconciliation with his mother and stepfather; twice he is spurned. His grandmother is no better. It is appalling, but also realistic. These kids are out there, and I am glad Banks put that fact in front of us. The protagonist points out that once he has been busted and released into the custody of his parents with the stipulation that he remain with them, and once they tell him to get gone (again), his way out of jail is to avoid parents, cops, and school, because each one of them will call another one of them in an effort to pass him to someone else. And the horrible truth is that he is right. Our unlikely hero realizes that in his quest for survival, he has never actually learned what is right and wrong. None of his parents (mother, departed father, stepfather) has demonstrated any sort of consistent moral code, and he is cast adrift not only materially, but also in terms of his emotional growth and the development of his character. He finds it in a really unlikely place. Like nearly everything Banks writes, Rule of the Bone is deeply disturbing in places and full of loss and anger. I have struggled with this when reading other books by this writer. Disturbing books are all the more disturbing when they are so well done that we cannot look away. To other readers who have noted this (in reference to some of the other reviews I have read), I would advise that if you can’t take it, don’t read it. There’s no law saying you have to read this writer. Particularly if you have recently dealt with loss and are tender around the edges, go find another novelist. If you need a feel-good book, there are plenty of them out there. For myself, I resolved my conflict of wanting to read one of America’s finest novelists versus wanting to avoid the abyss of depression they often inspire, by reading multiple books at a time. I move from Banks, to a nonfiction title, to a cozy feel good title, then back to Banks. Of course, there comes a point in the plot where Rule of the Bone can’t be put down, which is one more way we know it’s excellent literature. At that point, it’s time to dive in and finish. I’m glad I chose to return to this man’s work. The tone is bleak, and yet in this case, it also carries with it a poignant sense of hope and yearning. Highly recommended.